Clayton Thorson dives into the end zone against Wisconsin. The quarterback has seven rushing touchdowns this season despite negative yards. 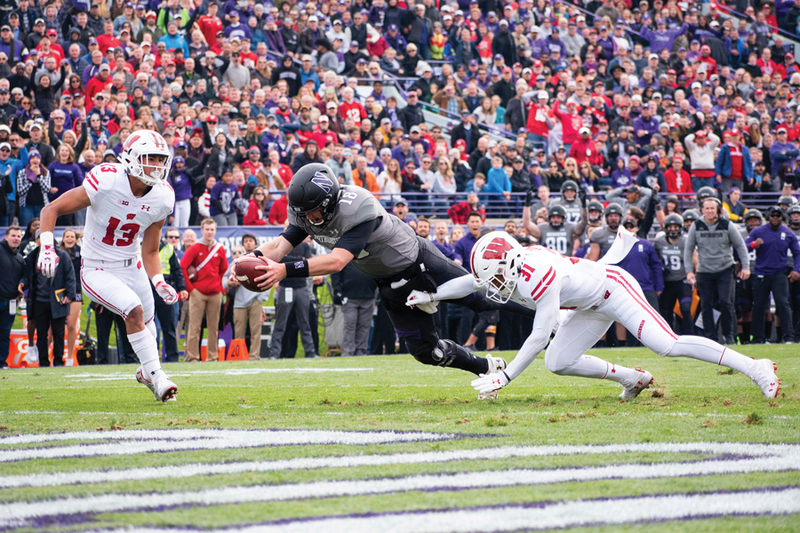 Clayton Thorson took the snap with less than two minutes to go in the second quarter of Northwestern’s game last Saturday against Minnesota, faked the handoff and took off to the right. There were shades of Aug. 30 in that run: On the second play of the Wildcats’ season opener against Purdue, the senior quarterback, in his first game since surgery to repair his torn ACL, also faked a handoff and then broke off to one side, looking for room to run. That time, he ran out of bounds for no gain. This time, he ran straight into the end zone for his seventh rushing touchdown and his second-longest run of the year. Thorson has broken numerous records for NU (7-4, 7-1 Big Ten) with his arm this season – most attempts, most completions, most touchdown passes – but he’s also having a unique 2018 campaign with his legs. While Thorson is now tied for third-most rushing touchdowns amongst Big Ten quarterbacks, he sits last among all players in the conference in rushing yards, with a net total of minus-99 yards on the season, largely due to the fact that yards lost on sacks register as a loss of rushing yards. He could become the first FBS player since at least 2000 to have seven or more rushing touchdowns while also having a net negative rushing yardage. It’s a curious figure, and Thorson said his runs are more products of reading situations than intended plays. Through 11 games, Thorson has kept the ball 63 times, the majority coming on third down, compared to 80 times at this point in 2017. Though Thorson has kept the ball less and run for less distance in 2018 – only eight of the 63 have been for five or more yards, compared to 17 last year – he has been more efficient in the late-down and short-yardage situations when he’s kept the ball. Nearly half of the 27 third-downs on which Thorson has held onto the ball this season have ended in either a successful first down or a touchdown, compared to only 31 percent in those same instances last season. In late-down and short-yardage situations – times when it’s either third or fourth down with five or fewer yards to go – Thorson has been successful on 67 percent of his attempts, a rise from 57 percent on 23 instances in 2017. More of Thorson’s runs this year have been about power rather than flat speed: Nearly a third of his carries have come when the Cats need just one yard for a first down, and Thorson has earned a touchdown or a first down in 13 of those 17 situations. Winning those short-yardage plays has become a point of emphasis for the offensive line as much as it has for the signal-caller. Moving out of the negatives isn’t entirely impossible for Thorson, especially with three more games left on the schedule. The senior is the first Big Ten player in history to pass for 10,000 yards and rush for 20 touchdowns in his career, and he’s four shy of Kain Colter’s program record of 28 rushing scores by a quarterback.